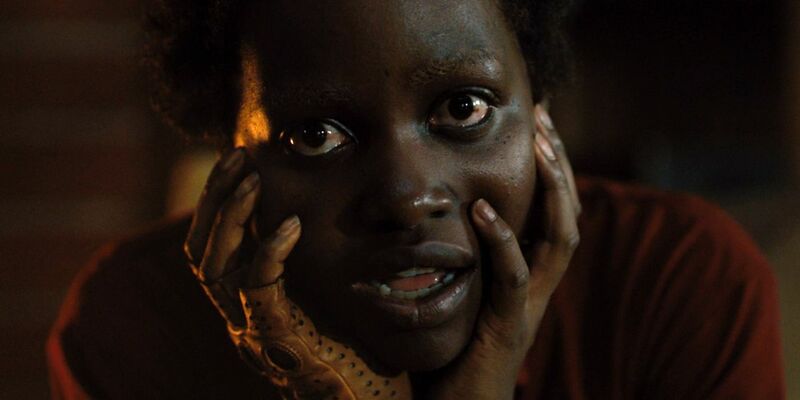 In 2017, after the success of his debut screenplay Get Out (which went on to win the Academy Award for Best Original Screenplay), Jordan Peele was quoted as saying that he has “four other social thrillers that [he] want[s] to unveil in the next decade,” clarifying that “the best and scariest monsters in the world are human beings and what we are capable of especially when we get together.” Just over twenty-four months after the successful release of the social thriller that showed the subtle and horrifying ways racism still prevails today, Peele followed it up with the release of Us, a film that hones in the idea that oftentimes we are truly our own worst enemy. 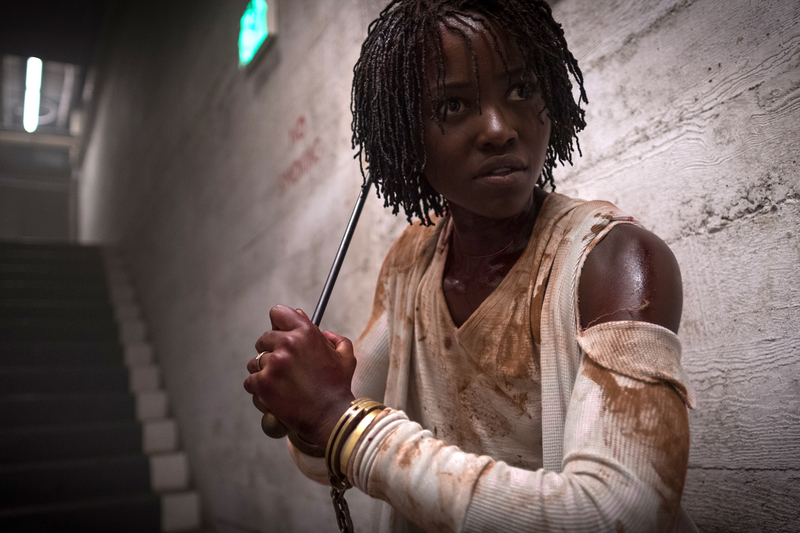 Although it may not be as effective as his debut effort, Peele still easily avoids approaching the idea of a sophomore slump, thanks in large part to the arresting performance of Oscar-winner Lupita Nyong’o. The most general summary of this movie is a simple one (that will now take 214 words to summarize because I am a hack), with Nyong’o playing Adelaide, a woman who had a terrifying experience as a child, where she came face-to-face with a girl who looked exactly like her. Decades later, she returns to the site of that experience on a vacation with her happy family, including husband Gabe, played with a perfect fatherly glee by Nyongo’s Black Panther co-star Winston Duke, and her two children, Zora (Shahadi Wright Joseph) and Jason (Evan Alex). After a series of strange coincidences catch Adelaide’s attention, the vacation takes a horrifying turn as their home is invaded by four people, dressed in red jumpsuits and armed with golden scissors, who reveal themselves to be exact doppelgangers of Adelaide and her family, led by the matriarch (obviously, Nyong’o again). Doppelganger Nyong’g, never named but credited as Red, explains that she is effectively a shadow version of Adelaide, forced to live a nightmare version of her life, filled with raw rabbit meat, sharp toys and a forced marriage to Gabe’s shadow, as well as the forced birth of Zora and Jason’s shadows. From there, it’s predominantly a film of survival, as Adelaide’s family evades their shadows while learning that they are far from alone in this nightmare. If this film were simply a horror film, with a capable cast and with Peele and his cinematographer Mike Gioulakis at the helm, it would excel at that. The home invasion scenes are beautifully tense, even on a rewatch, as each member of the family gets a one-on-one sequence with their shadow, all beautifully and hauntingly paced by Peele and shot by Gioulakis. But this film is able to stand out thanks in part to Peele’s script, but especially thanks to Nyong’o. It’s been a little over five years since the world was introduced to the force that is Lupita Nyong’o, as she won an Oscar for her feature film debut, as Patsey in 12 Years A Slave. Since then, however, she has been mostly relegated to motion capture work in films like The Jungle Book and the Star Wars sequels. Peele, however, has given her an opportunity to really show her many talents, and, y’all, she owns it. Both Adelaide and Red feel like fully-fledged characters, with histories and strong emotional ties, whether they be to her family, for Adelaide, or to the hate that she feels for her other self, for Red. It feels easy to say that Red is the more impressive performance here, with her raspy, halted and painful-sounding voice showing a character who does not typically need to use her vocal cords in such a dramatic way, and her very distinct and unsettlingly proper way of walking, but Adelaide is a force of her own, fighting to protect those that she loves, and Nyong’o gives both characters so much life that saying one performance is better than the other feels like a slap in the face either way. No matter which version of the character that you see, she demands your attention and refuses to let go of it. It’s an incredible performance that is able to elevate this movie onto another plane of greatness, and I hope to God it is not ignored in the awards season. Also, a quick shoutout to the hair and makeup teams on this movie, led by Camille Friend and Scott Wheeler, respectively. Each member of the cast does excellent work playing totally opposing versions of themselves, but those performances are elevated by the incredible work of both of those departments, really creating unsettling versions of each actor. Additional shout to those who worked on Nyong’o, in particular, with Friend being her hairstylist and Shutchai Tym Buacharern doing her makeup. Just truly exquisite work that will probably not get nearly enough attention. At the end of the day, Peele has proven himself to be an excellent horror storyteller, causing us to confront parts of ourselves that we don’t like but that cannot be ignored. The fact that he is the new face of The Twilight Zone should excite every one of us. Also. Put Lupita Nyong’o in everything. And actually her. No more Maz Kanata. Hear me, JJ? Make Maz a human and don’t explain it in Episode IX, you coward.